I'm going to have a busy month, so I'm getting this one done early - or I might not have time to get it done at all. However, I did get a chance to cook a few things from this box, so that's a plus. The sampling is easy. I've had a bunch of different varieties of Good Thins products. The sweet potato ones are made from sweet potato and wheat and are a good lower-fat substitute for potato chips. They have a nice satisfying crunch and are a little sweeter than a standard potato chip, but are still savory enough to go with a sandwich or with a savory dip. Yum. I love crunchy stuff. Speaking of crunchy, we have cookie thins. Thin cookies. Crisp. Satisfying. Crunchy. Really nice as a little snack, but I think they'd be fun for making ice cream sandwiches, too. I haven't tried that yet, but it seems like it ought to work. Sounds like a good option for folks who are gluten free. I passed these along to someone who need gluten-free foods. I'm perfectly fine with wheat. I've used a LOT of Goya products, so I was pretty sure I'd like this. It's an interesting combo of quinoa, rice, and black beans, along with spices. Great as a side dish, and really flavorful. If you prefer milder flavors, you could easily mix this with more rice, or add a can of black beans, and it would still be nicely flavored. 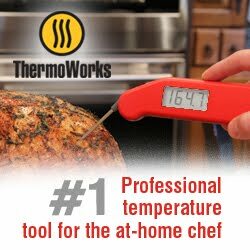 I needed to use more water and cook for a little longer than the instructions recommended, but that's to be expected since I live at high altitude. Besides using it as a straight-up side dish, this would make a really nice addition to a vegetarian burrito with some roasted vegetables and maybe some avocado. I've gotten varieties of these cookies before. The ones I got had dark chocolate and hazelnut cream. Oh heck yeah. The cookie part is a crunchy wafter that's crisp but not hard, and the chocolate is really nice. A lovely treat. I don't really eat a lot of bars like this, but I tucked this one away as a traveling snack. It's got quinoa flakes and puffs, pumpkin seeds, flax seeds, almonds, peanuts, and honey. Sounds reasonably healthy and filling, right? These are little bite-size chocolate and caffeine goodies with a dose of vitamins B and D. Three gems have the same caffeine as a cup of coffee, so they'd make a nice pick-me-up for days when you're too far from your coffee cup. Maybe that mid-afternoon slump. Bagged bakery snacks. I got a croissant with peanut butter and jelly that I passed along to a friend. I like peanut butter and I like jelly, but I'm not fond of the two together. It looked good, though. I'm sure you've seen these before. They're baked pizza crust rounds that you can just top and bake to melt the cheese and warm the rest of it. It's an easy dinner or snack or lunch or cut the finished pizza really small for appetizers. The great thing about these is that they're pre-cooked so they're not as perishable as raw dough. This isn't quite the same as pizza from your local pizzeria, but it's better than an English muffin pizza. I made mine with a tomato-based jarred bruschetta instead of sauce with cheese and vegetables. It was pretty good and crazy easy. This is a non-carbonated lemon and coconut drink. Like coconut lemonade, I guess. It might be fun for cocktails, but I'm not a fan of coconut, so I gave it a pass. I get these Degustabox packages at no cost to me so I can describe them to you. Yum. There are a whole lot of national food holidays, some of them sillier than others. March 7 happens to be National Cereal Day. Seems legit, right? To help me celebrate in style, my buddies at General Mills send me a sweet package to have fun with. Cereal, of course, but also a cereal spoon with the Cookistry name stamped in the bowl of the spoon. Sweet, huh? It goes nicely with a bowl that has my blog name on it. The cool thing about the gifts that General Mills sends is that they support small artisans. The spoons came from SweetMintHandmade.etsy.com. Go check 'em out! There were also photo booth props (glasses, lips, etc) from PartyGoodies.etsy.com. Fun stuff. Plus, some coasters and placemats and noisemaker things. And a tee shirt. Ooooh. Another cereal tee to add to my collection. I swear, I can go out in a nice top and no one pays attention. If I'm wearing a cereal-related tee shirt, random strangers talk to me about their favorite cereals from childhood. So anyway, I got my package, and you can have one, too. I'm making this giveaway super-simple. Just fill in the form and leave a comment on this blog post. No follows, likes or other stuff needed. Of course, if you want to like my blog on Facebook, that's cool. If not, that's okay too. This is a quick giveaway, so enter NOW. General Mills sends stuff to me at no cost on occasion and is shipping the prize to the winner. I'm a huge fan of the combination of nuts and chocolate. That includes chocolate covered nuts of all types, peanut butter cups, and pretty much every choco-nut thing that exists. Hazelnuts and chocolate are really good together, and when they're blended and creamy ... yum! 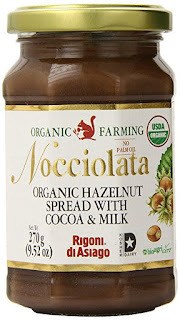 Speaking of "yum," the folks at Rigoni di Asiago, who make Nocciolata chocolate hazelnut spread, sent me some of that spread. I've tried it before, but it's been a while, so I figured it was time to give it another go. And, yum. 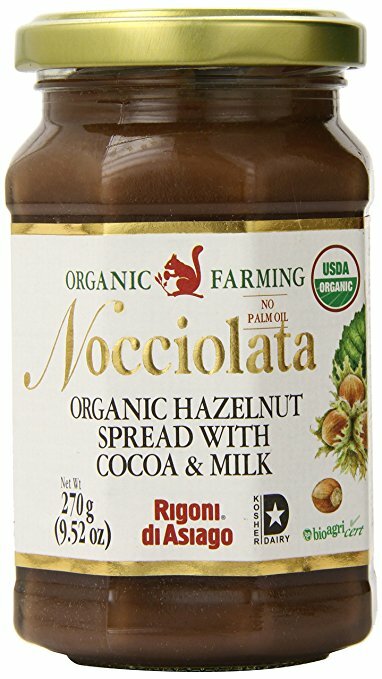 I like this better than the other chocolate hazelnut spreads out there. And yes, I did and actual taste test. I like the texture and the flavor of this one best. Not saying the others were bad in any way, just that this one hit all the right marks for me. Or maybe it's the Italian hazelnuts that make a difference. Did I mention that this is made in Italy? 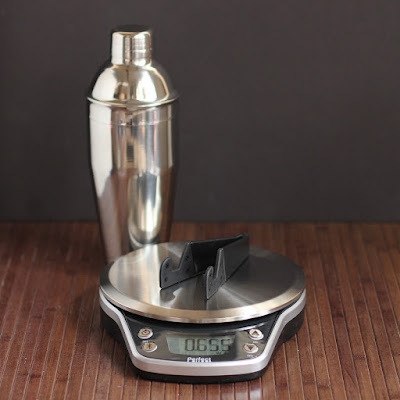 I was going to use it in a recipe. I was, but I didn't. I've used it before to make ice cream, and I might do that again one of these days. But really, it's just good on its own. Spread it on a shortbread cookie, if you must. But it's also really good on a spoon. A little spoonful to savor. If you haven't tried this brand, I suggest you look for it. It's not quite as easy to find in grocery stores as some of the others, but I've been seeing it a little more often. Not in every store I go to, and not all the time. But it's out there. Who's it for: Nutty people who like chocolate, too. Wishes: I wish this was as common as peanut butter. Source: I received this from the manufacturer for the purpose of a review.